YRVIND-TEN will hopefully be propulsed by three different kinds of forces, wind power muscle power and wave power. Here I will discuss wave power. Whalers had observed that a dead whale floating on the surface sometimes made about one knot of speed due to wave action on the fluke. It is said that some of the seamen being of the lazy kind cut of a fluke and fastened it under their boat that they did have to row. Haven’t been there myself at the time I do not give my guarantee for the truth the above. What is true and documented and still exists is a boat that was built in 1895 in Neaples Italy by Herman Linden. He worked at the Zoological Institute. He was watching the fishes and especially the dolphins as the moved by moving their tails. Somehow he got the idea to put a fin under a boat and get it to move with the help of wave power. He named the boat Autonaut because it moved by itself. The boat was 4 meter long and had a beam of 90 centimeter. The weight was 200 kilo. The weight of the fins was 40 kilos and part of the ballast. To everyone’s surprise it worked very well it made 3 – 4 knots of speed against the waves. Many more boats was built and experimented with during the following years. Einar Jakobsen was one of the experimenters. He had observed that a wooden board released from underwater was not floating straight up but gliding upwards at an angle. That gave him the idea. 1977 after some practical experiments did he build a foil that converted 80 % of the wave energy into propulsion. His foil hinged on an axis. Elastic spring regulated the angle of attack. A BBC TV-team filmed his boat making 6 knots against the wind. There is a lot of energy in the sea, on the average about 100-horse power per front meter. But then of course you have to leave flat water behind you. 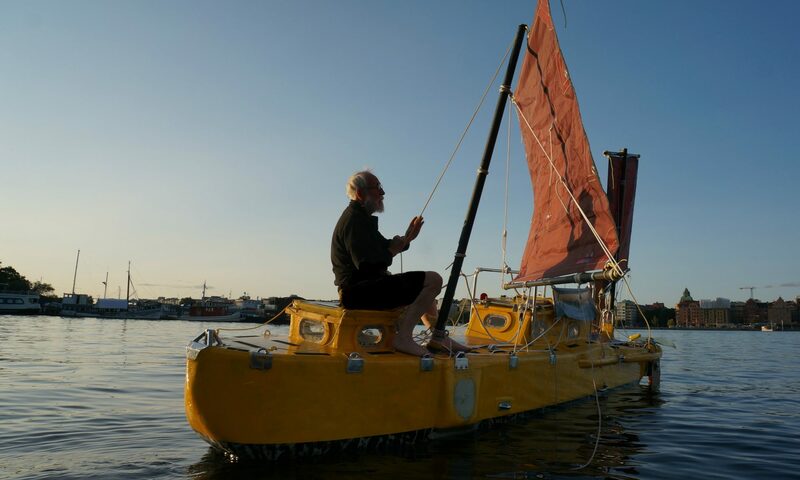 In 2008 Japanese yachtsman Kenichi Horie wave powered his catamaran from Hawaii to Japan. The journey took 110 days. Wave propulsion has seen a lot of promises and a lot of setbacks. The problem is, grownups always want bigger and bigger things. Some things are intended for small things. Galileo was the first one to scientifically explain why scaling up a small successful idea does not work. Among engineers it is called the square cube law. If you double the scale of a structure the surfaces increase by the square that is four times but the volumes increases by the cube that is eight times. The strength is in proportion to surfaces load is in proportion to weight. That explains a lot of things among other why small things are stronger than bigger ones. That is why it easy to build a short bridge and why it becomes more and more difficult the longer they get. It explains why birds only grow to about ten feet wingspan. It explains why a wave-propelled boat is better being small. If you are small you can get away with things that are impossible for big creatures. Some small spiders spin a thread when they feel like traveling. The thread being light is caught by the wind. When the spider judges it long enough he lets go of the ground and flies to his desired destination. To land he eats up his thread, recycling it. It is protein after all. Being small he has a happy landing. He has been flying without using non-replaceable fossil fuels. Lets do like the small spider and not like the grownups. Like what is small and natural. Support small projects. At the moment I am trying to integrate wave power propulsion in the YRVIND-TENs rudder system. I have some good ideas but there is as usual some interference with other functions. Nothing is as much fun as solving problems.